To all my friends in Virginia: I'm scheduled to have a book signing at Books of Merit at the Dayton Farmers Market on Saturday, December 29 from 11 a.m. to 2 p.m. I'll have my new books on hand. Come say hello if you're in the area. Today a Facebook exchange triggered a faint memory and I'm hoping some other Yoders can help fill in the details. It is now the 11th of December and I have not had any head-cold-turning-to-chest-cold-turning-to-bronchitis-and-please-let-me-die-now-asthma this fall like I had four times last fall/winter/spring. Was it the flu shot? More vitamin D? More exercise? God in his mercy deciding I'd suffered enough? I don't know, but it is really nice, and I am grateful. So, guess what. A week later I got sick with the cold and flu that Jenny was just getting over. The battle is on. My cold vs. echinacea, Vitamin C, Goldenseal, Advair, Vitamin D, garlic, beclomethasone hypropionate, NyQuil, Albuterol, and ibuprofen. This is war. Lots of folks cheered me on in the fight. Some added remedies of their own: apple cider vinegar with blackstrap molasses. 1 teaspoon honey mixed with 1 teaspoon cinnamon. I tried this, since I had both on hand. The two don't combine well. Jenny took one look and said, "That looks like when I spit at the warehouse." Of course we had one person who linked a story saying that studies have shown that most of my remedies don't work for the common cold. This person is studying to be a nurse, so he will someday be the professional who tells moms that no, there is no way that teething can cause fevers. Not that I carry grudges or anything. Our friend Hans posted this: "I hope you survive the cures." Later he added: "I would suggest also taking boiled extract of squirrel dung. It's all-natural, so it's good for you. And I heard it cures everything from Cancer to the Common Cold." And suddenly, there was that little memory ringing dimly in the back of my head. Dad told us the story many years ago. It happened, I'm guessing, when he was a young teenager. They lived on a farm in Oklahoma, and one of his brothers--I don't recall which one--got the measles. He was very ill, and the family was desperate to help him. Someone told Grandma that a cure for measles is "schof-gnuddla tae," or, God have mercy, tea from sheep turds. Well. Desperate times call for desperate measures. A neighbor had a flock of sheep. After dark, Dad saddled the horse, rode to the neighbors, snuck out in the pasture, and gathered a supply of "gnuddla." Grandma brewed the tea. The sick boy drank it. He recovered and obviously lived to a ripe old age, since all those uncles did. As I recall, this remained a secret between Dad and his mom until he told us. And now I've told the whole world. Do any other siblings or cousins remember this tale? And no, I am not yet desperate enough to try this myself. "There is for real grass growing on the floor of dad's car"
For years, I have been on a quest to conquer occasional depression and every-winter SAD without resorting to prescription medicines. This led to sitting in front of a special light for a grueling half hour every morning plus vitamins and potions of every description. I've been most successful with a combination of Vitamin D, St. Johns Wort, and 5HTP. But lately I felt like that wasn't quite cutting it for this stage of life. My friend Judy recommended something called SAM-e. When I hear that name, I always think of an Amish guy with a big bushy beard and glasses. "Did you get some calves from Sam T. Yoder? No, it was Sam E."
Then I went breezing toward home but on the way I stopped at my friend Heidi's little bent-n-dent store, Grocery Deals. I love that place. You never know what you'll find. Sometimes it's staples: flour, aspirin, honey. Sometimes it's exotic-for-me foods like those little cards with little spice packets to make chicken cacciatore or shrimp alfredo. And the price is always a fraction of what you'd pay at a regular grocery store. Today I was almost ready to check out when I looked at the vitamin and medicine shelves. Yes, aspirin for my migraine regimen, toothpaste for Steven. And oh my stars. One box of SAM-e. Exactly like what I'd bought at Walgreens. I think Heidi will testify on my behalf that I did not actually dance and sing in the aisle, but I felt like it. She helped me hunt for more boxes, but that was the only one. She suggested I post about it. I said I would. I love Grocery Deals. You will too. It's in that little Tivoli Village complex on the south end of Junction City. 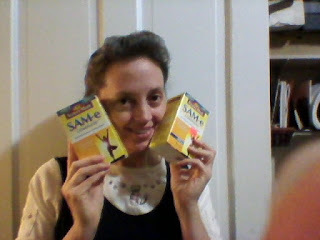 Lookin' happy with SAM-e and Grocery Deals. Today Emily and I cleaned out the fridge. You may recall that three of my children moved east in two weeks' time in September. Years ago, I snickered mockingly at both my mom and mother-in-law, because when their children started leaving home they still bought huge amounts of groceries and cooked big cauldrons of food. They just couldn't seem to help themselves. At the time, I thought, Seriously, this is not rocket science. Just buy and cook less. I have now repented of that attitude. Skype is wonderful when you have children away from home. On Thanksgiving Day, there was Amy at her aunt Barb's house, carrying her computer around to give us a tour of the huge old house, and then Matt walked in and we got to see him too. I connect with Ben in Toronto every now and then, listening to the words but also evaluating his image on the screen--is he happy? should I suggest a haircut? And yesterday I talked with Matt all the way off in Washington, DC and "met" his landlord when Matt swiveled the screen. And hmmm, Matt now has a beard. I asked how he gets by with a beard if he's working for the Navy. "I'm a civilian, Mom. They don't care." Someday I will wish I had paper-and-ink letters from this era. But we all know that Skype or no Skype, my boys wouldn't be writing many letters. So we continue to appreciate Skype. Another shooting, this time in Portland, at Clackamas Town Center. It sounds like it was right at the spot where my SIL Geneva and I had lunch, once upon a time, back when she worked at Macy's. There is no making sense of these things. It is not in Paul's nature to panic, but he got as close as he gets when it looked like a whooping cough epidemic was about to engulf our church school. Should he shut down school, cancel the Christmas program, keep all the siblings home if one child got sick? He contacted his sister the doctor and talked to the county health department. I sleuthed for answers online, primarily to find out the risks for asthmatic adults exposed to whooping cough. But then the two coughing boys were taken to the doctor and told they don't have whooping cough after all. And the one diagnosed family was quarantined in time. Speaking of asthma and relief: It is now the 11th of December and I have not had any head-cold-turning-to-chest-cold-turning-to-bronchitis-and-please-let-me-die-now-asthma this fall like I had four times last fall/winter/spring. My new book is selling well, so thank you to all of you who played a part in that. And special thanks to the four fearless folks to went over to the Amazon page and left a review. Today I was at the post office mailing a bunch of book orders. A woman was there struggling with getting a package ready to send to her mom, so I helped her tape it up. She noted my veil and said she likes to wear a pink knitted prayer shawl when she prays. Then she said, "Do you know if Dorcas has written a book? I met her in 2006." I said, "Um...actually I'm Dorcas." She engulfed me in a hug and said, "I was praying to Jesus that I'd run into you somewhere!" Wow. I'm not sure why she wanted to see me, but we had a nice chat and I put her on my list to get my column by email. And it was nice to know I was the answer to someone's prayer. I wrote about this for an essay writing class I took through Lane Community College, way back in--I don't know--maybe 1997. Then I also sent it around to be critiqued when I was in one of Verda Glick's famous Writers Workshops by Mail. The other day Verda sent me an email. "Dorcas, when I read this ad and watched the video (see below), it reminded me of the very first time I read your writing. It was that cute sketch about Paul’s grandfather and his DMSO oil. I was captivated by your writing then, and I still am." I watched the video. It told tantalizingly of a miracle chemical that relieved pain and was absorbed rapidly through the skin and much more, and finally they said what it was called. Yes. DMSO. Emily glued a picture of Abraham Lincoln to the back of her phone so she could more easily distinguish it from mine. Steven: THAT'S a creepy guy! 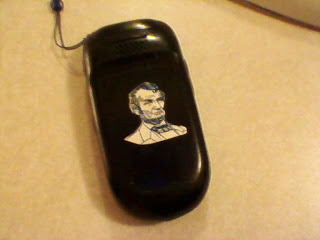 Emily: Steven, that's Abraham Lincoln! He freed you! Steven: He didn't free me! Emily: Well, he freed your ancestors' cousins! Emily: I felt so clever when I said that. Jenny: He looks more like Grandpa than Abraham Lincoln. Today's Letter from Harrisburg is for you if you buy people gifts you think they ought to want. Or if your mother does this to you. Maybe the biggest lesson from this is that it's dangerous to clean off your desk. This afternoon I took a nice Sunday-afternoon nap and then went in the office and checked Facebook. Pretty soon Jenny came wandering in, holding a little black book. She began to giggle. "The sister whose husband is in the ministry has a very important role in the work of the church." She stopped beside me and read further. "'The faithful wife is clothed with meekness and quietness.' Hahahahahaha!!! 'She is of a submissive spirit, obedient to her husband. Her life will enhance his acceptability and usefulness.'" More laughter. "Oh, Mom, this is so not you." "Jenny, what in the world?" She waved the little black book. "It's called a Ministers Manual. 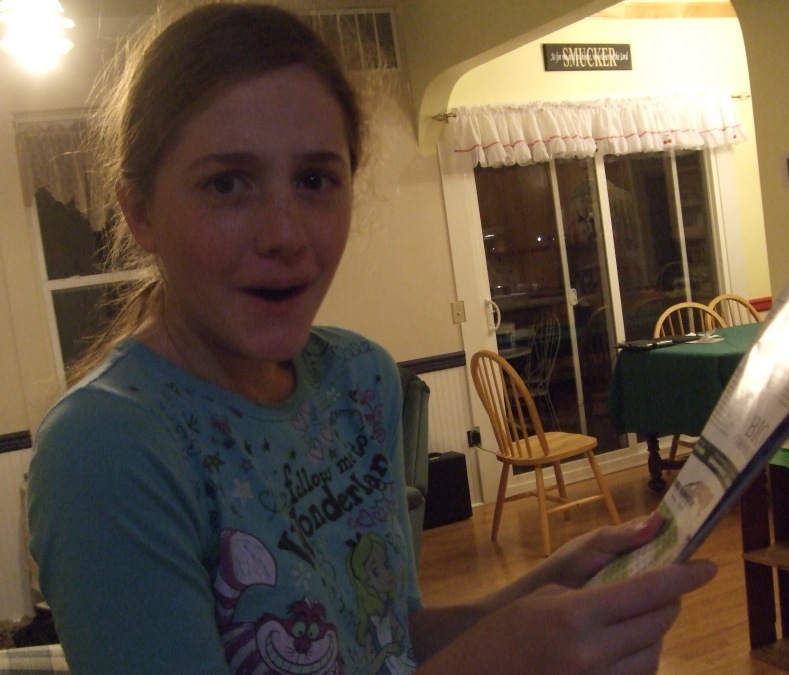 Emily found it after Dad cleaned off his desk. I guess it was down in under stuff." "Wow," I said. I may have rolled my eyes. "It says it was given to Dad when he was ordained. And there's this section in the back called 'The Minister's Wife.'" "She is an example for all women in all things. As a rare jewel, she ornaments the work of her husband." Then, such gales of laughter as to render her hardly able to stand up: "Her house is in such order so as to enable the family to accomodate visitors and guests at any time." This continued on for two more pages. Paul, from the recliner, wondered what was so funny. Jenny read him some choice passages between spasms of giggles. Paul didn't see what was so funny. "What, you don't think Mom is an example for other women?" As mentioned, I just sighed. Is it any wonder no woman aspires to be a Mennonite minister's wife? Seriously, I don't think there's been a Mennonite girl in recorded history who said, "Ooooh, wouldn't that be nice to be a minister's wife?" In fact, I think it's more likely that girls look at their boyfriends with a critical eye, wondering how much chance there is that they'll be ordained someday*, and consider running for the hills if any signs point in that direction. *Since we choose ministers out of the laity, as the need arises. I'm sure I've mentioned before that one of my gripes with this role is that it doesn't come with a job description, only a few Scripture verses and a long list of unspoken expectations, largely from yourself and also from people in your church. So you never feel that you're doing all you should. So I really ought to be gratified to find a job description, written down. But as we can see it is so far from my reality as to make my irreverent daughter stagger all over the office in shrieks of laughter. 1. Be there for your husband and support him like crazy. 2. Tell him the hard stuff that no one else will tell him. I've often resented that last item and told Paul that I wish someone else would tell him this stuff. But somehow the Mennonite church structure does not lend itself to anyone taking the minister aside and saying, "That is a really bad idea. Don't do that." Or: "Do you know that you hurt Jim and Grace very badly?" Or, "You don't want Charles for that position. He has an agenda and he's mean to his wife." This is stuff you wish your husband would just KNOW. But usually he doesn't. And you wish someone, anyone, else would tell him. But they don't. So you have to, and it's not easy. And you can quit hoping that those submission verses make it ok to just be quiet. They don't. I found it intriguing, watching my friend Rachel's funeral online, that in her husband's tribute to her he said something like, "Rachel, now that you're gone, who will talk straight to me?" I thought: even you, Rachel, sweet and kind and fitting that Minister's Manual description a hundred times better than the rest of us, even you talked straight to your husband about the hard stuff he needed to hear. It's a complicated thing, being a wife, and an even more complicated thing, being married to someone in leadership. But if we have to be married to someone in the ministry, may we all be so fortunate as to be married to someone who loses the Minister's Manual in the piles on his desk and never tries to hold us up to the standards of that intimidating section in the back of the book. And who listens to us even when it's hard. And with this fine review on Gina's blog, Home Joys, the blog tour is over and we pull into our driveway and we're home. Gina writes about the practical side of homemaking. Stop by for recipes, tips on gardening, and much more. Many sincere thanks to the 19 folks who read the book, put together a review, and organized a giveaway. I hope you all gained lots of new readers. And thanks to everyone who followed the tour and commented on the posts. Special thanks to everyone who read your posts and decided to order a book. Second-to-last blog tour stop: Christine at Shall Run and Not be Weary. Read the review and enter the giveaway, then read on about this family's experiences with international adoption. YOU are invited to come hear the Joyful Noise Choir's Christmas concert. Friday, Dec. 7. Prelude music at 7:15 pm. Concert at 7:30. Community Bible Church, 2600 Stoltz Road, Lebanon, Oregon. I'm both biased and unmusical, but I'm told that this is an exceptionally excellent choir for its small size. Come hear for yourself. This blog tour has been great fun for me and I hope for everyone else involved as well. Today we head to Bethany's blog at About My Father's Business, in which we discover that she and I have similar husbands. What fortunate women we are! Me: [Reading blog tour comments] Oh dear. How can I tell if all these nice comments are going to my head? Emily: If you start having dreams that they're going to make a movie out of your book. Jenny: with Brad Pitt starring as Dad. Kim Martin and I go way back to my Amish days, and in today's review she remembers what happened when our horse, Fern, got too old to pull the buggy up the hill. Since then, we've met at very random times and places, and I wish we could sit down and reminisce over a pot of tea. You'll enjoy her review, I'm sure. Right here. The last week of the blog tour is underway. If this is an east-to-west journey, we're about in Utah and getting to Idaho soon. It's been fun for me and I hope for you, too. Today we go to Mark Roth's blog. He was nervous about being the only guy on the list but he shouldn't have been. Special: all four of my books for $40, including postage. U.S. customers only. Thanks again for coming along for the ride. 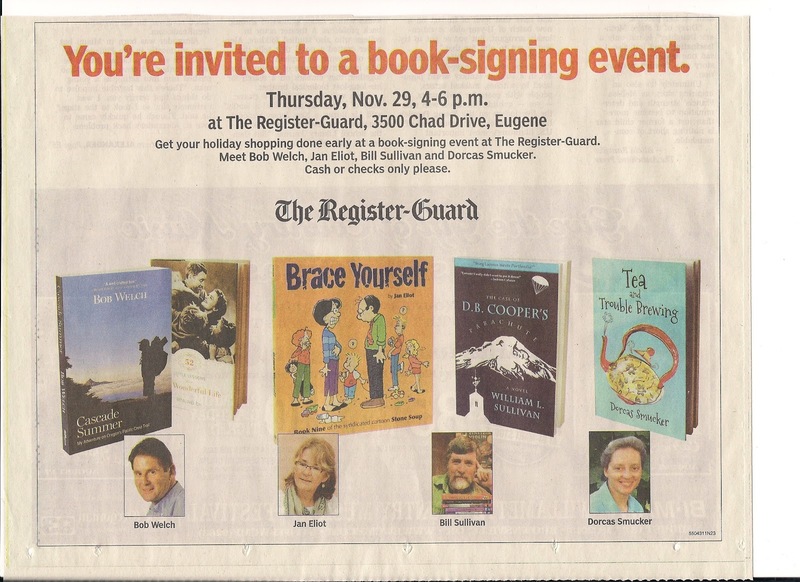 This Thursday from 4-6 pm there's a book signing at the Register-Guard building at 3500 Chad Drive for RG authors. In case you can't read this, the others are Bob Welch, Jan Eliot, and Bill Sullivan. 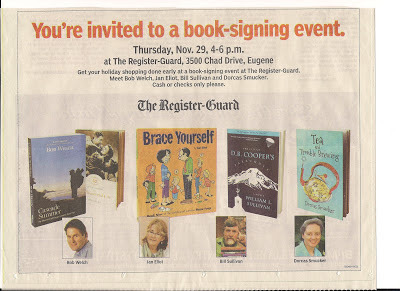 They had this very nice ad in the print edition, but I couldn't download it from the website, so I scanned it instead. Back to the Blog Tour: Today we visit Mary Ann at A Joyful Chaos. Mary Ann is the co-author of the "Lily" books, based on her childhood. You can check them out in the sidebar after you sign up for the giveaway. Today we go all the way to Poland and Anita Yoder's Tis a Gift to Receive. She's a true word-crafter and you'll enjoy reading her past posts. She's also the first blog tour host to do an interview. There are plenty of things I like about Christmas. The celebration of Jesus's coming. But there is one thing that I very much dislike: shopping for gifts. Or, more accurately: shopping for gifts when I have no clue what people need, and have a feeling they really don't need anything I can give them. You are all bouncing in your seats, waving your hands, and yelling, "But Mrs. Smuckerrrr..!!" Calm down. I know what you're thinking. I should get creative and make stuff. Special stuff. Personal stuff. Tea cozies and candles and tote bags and cookies in re-purposed tins and big stick pretzels dipped in white chocolate. I won't have time for that unless I don't sleep for the next month. Also, this is too much thinking for a brain so overtaxed that it forgot to invite John and Laura to the family Thanksgiving dinner, thinking they were still in Poland or something. Thankfully someone else was on the ball and called me up. "Um, Dorcas???" The other day while Jenny was in choir I wandered around Walmart, picking up milk and meat but also scouting out gifts. Clothes? How many people really want their moms to buy them clothes? Electronics? Tools? There is no possible way I'll pick the right thing without being specifically told, so why not just hand them a few twenties and say, Here. Help yourself. Popcorn in Santa tins, cellophany pre-packaged cappuccino mixes with cups, glass jars with red candles so strongly scented of cinnamon that they set off an asthma attack. 1. When I know someone needs something and I can fill that need. Like a gas card for your child's teacher. Or the year Paul's sister needed a coat and we all pooled our money and Bonnie--whose taste we all trusted and who enjoys shopping--went and picked it out. 2. Words. If I send Christmas cards, I can't sleep at night unless I include some words conveying what these people mean to us and why they're special. I would be thrilled if everyone who normally buys me gifts would sit down and write a few pages of nice words instead. Well, I also wouldn't mind that cute little teapot at Shoppe of Shalom, ceramic, with an infuser, or the stack of cute note papers in the third aisle. But words would be fine too. Today I was talking with a young person about how those first gifts after you start dating are fraught with peril and heavy with meaning. I remember buying Paul I think two different gifts and returning both of them before I finally bought a set of James Herriot books because he likes to read. However, he has never really liked James Herriot. He married me anyhow. And today he went to Home Depot and used a gift card from last Christmas to buy some on-sale tools he needed, then he came home and gave me the tools and said I can wrap them up and give them to him for Christmas. We are one couple who does not fight about finances. "I always thought if I was going to buy a guy clothes, it would be from a cool store, like Old Navy. But the other day I was kind of startled to realize that if I was going to buy clothes for him that he'd like I'd probably have to go to Coastal Farms." Marching on with the blog tour: today we visit MaryAnn Yutzy's Xanga page, where she reminisces, reviews, and even offers a photo of Tea and Trouble with a very charming teapot and teacup. Trust me, perusing this will be more fun than fighting crowds at the mall. Today we go way-way-way up north in Alberta to Luci's blog, Quiet Hearts. It was nice having a Canadian on board so we Americans could all spend the day fixing and eating food. You'll enjoy Luci's post, and the rest of her blog. She has a thoughtful, humourous* touch all her own. *spelled in honour of Luci. Today we head over to Treasured Up and Pondered, a beautiful blog by Beverly. You can read a sample chapter of my book for free, enter the giveaway, enjoy the review. Today we go local again. LeAnn is my friend Jean's sister and a writer who tells about her life at W.L.E.N musings. Connections: lunch together at a writers' workshop once upon a time. She offered me meaningful empathy when I lost a nephew, as she lost a nephew in Iraq. And once upon a time I met her law-enforcement husband when he was um, enforcing the law. Today we head over to the intrepid Rhonda Schrock's blog. You'll see that she and I have a lot in common. As she says, our "works in progress" text us incessantly and call us "Mom." Don't forget to comment if you want to enter the giveaway. Today we go to visual artist Lydia Jo's blog for a review and giveaway. Enjoy her review, leave a comment, and then click around to see her photos. Today's stop is at Crystal's Cliffnotes. She read my Letters from Harrisburg in the RG when she was a child. Have I been writing long enough for a child-reader to grow up and have children of her own? Apparently so. A fun read, and a giveaway of course. Today's blog tour stop is IttyBitty Blog. Darcy is the only blog tour host who reads my column in the newspaper, long before it ever shows up in a book. Thanks, Darcy! Today we will learn about commas in a list or series. You learned this in the fourth grade: word-comma-word-comma-and-word. Phil, Marcus, and Fred are my brothers. Today I did laundry, talked on Skype, and washed the dishes. We note that the series should be a series of similar items. All colors, or all guys' names, or all verbs. This is called "maintaining parallel structure." Maintain parallel structure with items in a series. Items in a series should have parallel structure. You maintain parallel structure when you use equal grammatical units. If the first item is a noun, then the following items must also be nouns; if the first item is a subordinate clause, then so must the other items be. Harry spent his afternoon , , and . Harry spent his afternoon playing tennis, returning overdue library books, and then he ate a mushroom and pineapple pizza. Harry spent his afternoon playing tennis, returning overdue library books, and eating a mushroom and pineapple pizza. This afternoon, Harry played tennis, returned overdue library books, and ate a mushroom and pineapple pizza. There is this terrible habit spreading over our great land to start off a series and to do ok with items one and two, but item three goes slithering into the blackberry bushes in a different form altogether. "We're offering free sitting fees, a free 8x10, and we'll also email you a digital copy." "'I love it here at the Mission. There is acceptance, no judgment, and I've made a lot of friends.'" " Obama: 'I've now dealt with a lot of world leaders, and I think that Chancellor Merkel is smart, practical, and I trust her when she says something.'" "Meet Fitbit Zip. Tracks steps, distance, calories burned and uploads wirelessly to your free Fitbit.com account via Bluetooth 4.0/Smart Ready devices." "See more clearly, sharper, and vividly than ever before!" "We make quilts, wall-hangings, crib quilts & specialize in repairs, as well as finish the quilt top that you have started." "You’re educated, well-read and are the go-to person for solving your family’s and friend’s problems." "Crocheters already know how to tension the yarn, hold things in their hands, and all they really need to learn (in order to knit) is how to pass a stitch from one needle to another." "A former classmate, Austin Caisse, 17, described the suspect as “brilliant,” and told the Post he was into Japanese culture, anime, and shared an interest in collecting knives." But I can't resist a few more samples of other bad stuff I found. "So, as we watch the election results with baited breath, hopefully none of this information will even be necessary." "Denise is a mother to 3 incredible boys, one GIRL dog, and a wife." "That has helped purge me of a blood clot and my mother in law." Head over to Miriam's blog today for a thoughtful review of Tea and Trouble Brewing. Giveaway included. And a list of connections. Connections make me very happy. Here it is. Enjoy. Win. Day 3 of the blog tour for Tea and Trouble Brewing takes us over to Gabrielle's charming blog, Project Paperie. There are many perks and benefits to being The Principal's Wife. Parent-teacher conferences are a breeze. If the children misbehave in school, I don't have to tell their dad about it. We get cool stuff from A.C.E., like flash drives and notebooks. We get cool catalogs, everything from cheerleader uniforms to cheap cutesy erasers, shaped like hamburgers and hot dogs, made in China of course. I get to provide props for the Christmas program--the ham for the Herdmans' food basket in The Best Christmas Pageant Ever, the guys' bathrobes for the Nativity scene, Paul's old graduation honor cords for the angel's sash. It makes me feel included. But last Sunday in our mailbox we found the most amazing perk ever. Seriously, I am not trying to make you jealous, you who are not the principal or his wife, but I won't blame you if you are. 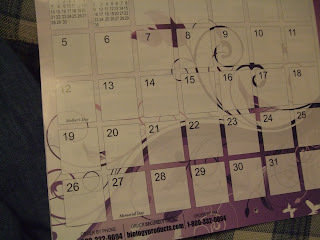 It was a free calendar for 2013! And not just any calendar. It was a lavishly illustrated calendar from a place called BIO Corporation. 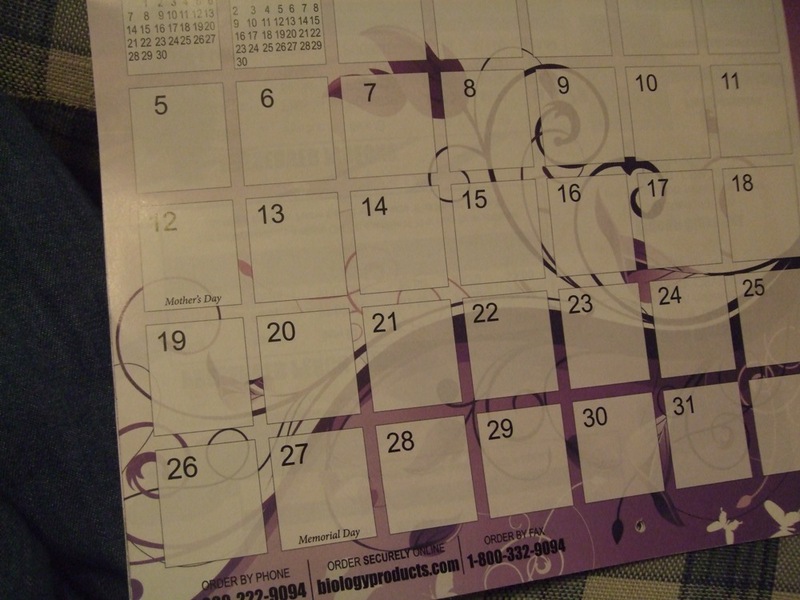 More than any calendar I have ever owned, this one earns the title of "truly unique." Every month's page is beautifully decorated. And then, above the beautifully decorated month, is a whole page of detailed descriptions and pictures of "preserved specimens" you can buy for your school. See? 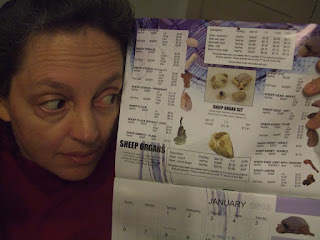 Here they offer "Sheep organs." 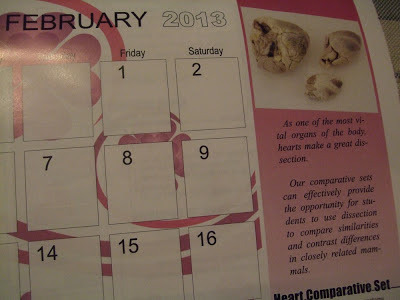 On the February page, they give you a helpful little sidebar lesson on hearts! How clever is that! Check this out! 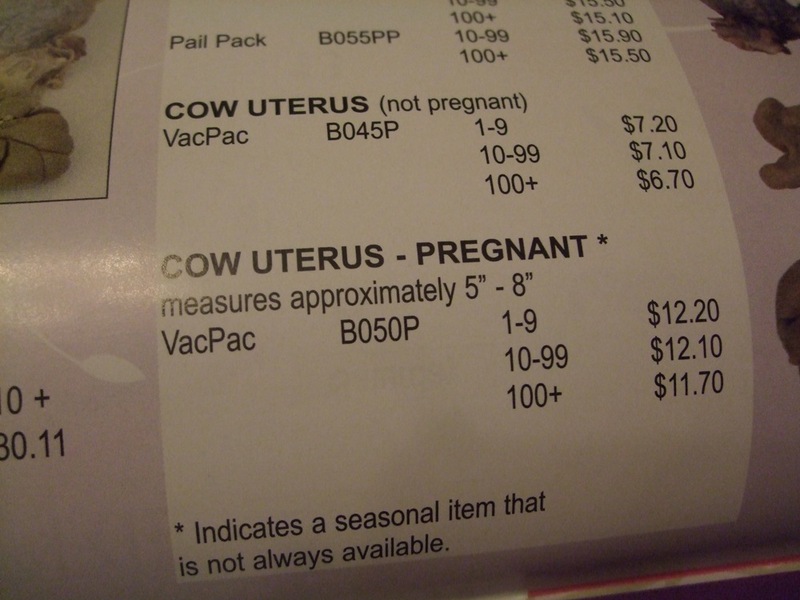 A cow uterus, either pregnant or not! 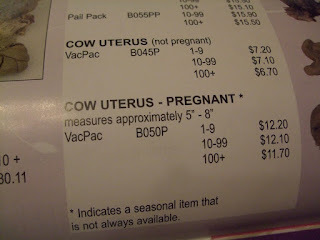 Your choice, but the pregnant one is a seasonal item, just remember that. 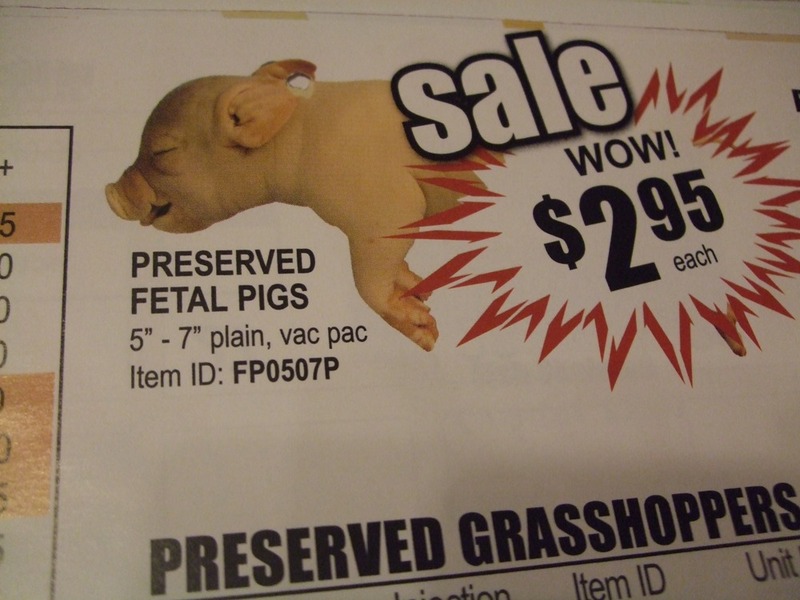 Fetal pigs! As they exclaim here, on sale for only $2.95!! Wow! I'll bet YOU don't get to look at something like this for the whole month of July! 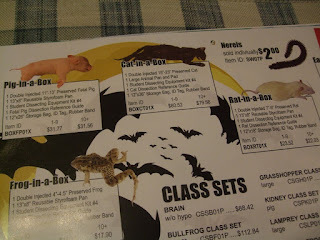 Pig-in-a-box, Cat-in-a-box, Frog-in-a-box, even Rat-in-a-box!! Excuse me while I note this for my Christmas list. I'll bet Grandma would like this much better than shower-gel-and-pouf-and-lotion-in-a-box. The selection is simply amazing! Turkey heads! Pig stomachs! Garter snakes by the bucketful! Lampreys! Frogs! Preserved leeches! I hope we can agree on a prominent place to hang this calendar to grace our home in the coming year! I tell you what, there's nothing quite like being the principal's wife! Unfortunately, our daughter somehow failed to appreciate the unique qualities of this gift. Here she is looking at the samples of skinned cats. "Beef organs?? Ewww is that a dead pig?? [flip] Eww!! [flip] EEWWW!! Mom, look at this!! They preserve RABBITS??? Ohmygoodness! OhnoOhnoOhno! A cat! A pretty cat! 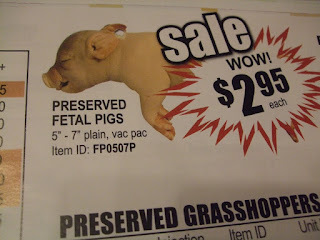 You can buy dead preserved cats! I'm not kidding that is just gross! [whimper] This is horrible. You have to destroy this. I'm almost in tears!" Today's featured blogger is Jan Pierce at Words for the Journey. Today's column is a lighthearted expansion of the Wall Words blog post. First stop on the blog tour for Tea and Trouble Brewing: A thoughtful and thorough review by Amanda Bird at Birds' Books. Stop by, enjoy, sign up for the giveaway. I'll bet there were hundreds of people like me, people who ran into Rachel only occasionally, but whenever they did, they felt like a wilted potted plant who had just received a soaking cupful of cool water. I don't think we talked much the first time we met. Her husband, Ernest, was the guest speaker at our mission's annual "Staff Fellowship," and Rachel and a baby or two came along. It was held way up north at Stirland Lake High School, back around 1990. We were living at Round Lake then, deep into challenges far too big for us; lonely, overwhelmed, and exhausted. Ernest spoke about "The Wilderness." I recall this because his stories of the Israelites in the desert paralleled my own life, and I remember sitting there in tears while he spoke of the hardships of the wilderness, and of a place of water and palm trees. Those of you who have been there will recall how the chapel at Stirland Lake was on the top floor of the main building, and you came up the stairs at the back of the chapel. I was sitting there in one of the back rows listening to one of Ernest's talks when I saw movement out of the corner of my eye and turned to see Rachel coming up the steps and standing at the top. I think she was holding a baby, and she stood there looking at her husband with a face I can only describe as "glowing," a rapt expression that said, "That man is the most amazing guy in the universe and I am so proud of him and I am the luckiest woman in the world to be his wife. And just listen to him speak, did you ever hear anything so profound?" Her face also said, "I am totally content and happy to be completely anonymous in the background." It was not a face you'd forget. I got to know Rachel a lot better many years later when she, my cousin Kay, and their friend Karen organized a women's retreat that I spoke at, in northern Minnesota. Rachel was a quiet ministering angel in the background, making sure that my needs and a hundred other details were taken care of. She and her daughter also spoke at that seminar, an amazing story of their journey through the daughter's medical issues, and of their faith and humor through it all, and of looking for--and finding--an unusual number of rainbows throughout the journey. When the Witmers moved to Los Angeles, they travelled through Oregon a few times and came to our house for a meal or visit. They were people we felt comfortable with from the minute they stepped in the door, and the conversation went right to the heart of things. Again, we felt like well-watered plants on a hot day. On their last visit, Rachel asked me about my writing and speaking. She seemed intrigued by it, with that life-giving interest that was neither awestruck nor gushy, just interested. And then she did something no one else has ever done, before or since. Nonchalantly, as though she were offering to give me a recipe or do some other simple good deed, she said that if I want to, I can email her a list of prayer requests before I give a talk, and she'll pray for me. I thought, wow, she's a busy woman, she probably has pages of people to pray for every day, and just as no-big-deal as that she offers to add me to her list. I took her up on her offer. It wasn't that often, but it was so nice to know that I could send her an email and ask her to pray without feeling like I was imposing, because it was her idea, after all. Rachel was suddenly, shockingly, taken from us this last week. A car accident in Colorado, just days before her son's wedding. It still seems impossible, that she was ripped away from family, friends, ministry, everything she was so deeply invested in. I considered going to the funeral, but I was committed to giving a talk at a church in town the next day and didn't want to cancel. I knew she would have understood. I watched the funeral online. It was a beautiful tribute to her, a mix of grief and glory. I remember her face at the back of the chapel at Stirland Lake, and I imagine her gazing at Jesus, at all of Heaven, still happy to be in the background, still rapt and glowing, full of love. 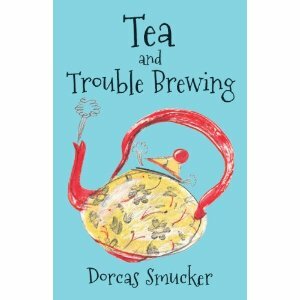 I was delighted with the response to my request for bloggers willing to review Tea and Trouble Brewing. Eighteen of them! So, starting this Sunday, I'll be directing you (almost) every day to a stop on the TATB Blog Tour. Each blogger will not only review the book but will host a giveaway. So the more of these blogs you visit, the greater your chances of winning. And with all of these blogs, you'll want to stick around and read a bunch of previous posts after you enter the giveaway. Lots of good writing represented here! *Anita lives in Poland so she might not do the giveaway quite like the others. "The giveaway makes me laugh because I remember when I first started blogging and I wondered What in the world giveaways had to do with blogging. I still don’t really know the answer to that. But I think you will like this one. I’m excited about doing it."